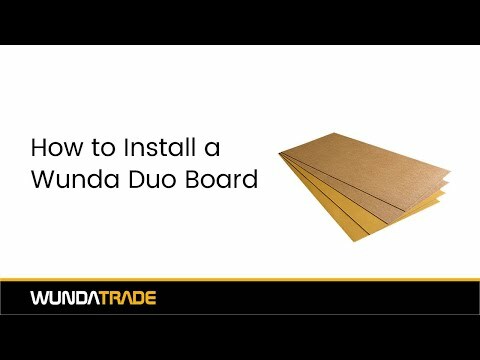 Duo Board is a free floating HDF sub-floor specifically designed for installation over floor heating to provide a smooth, stable and level base for laying off the roll carpet, vinyl and linoleum directly onto . The DUO BOARD system comprises of two layers, a base board with adhesive surface and a top board both are laid in an overlap/brick bond fashion. (For Karndean and Amtico planks we would recommend a renovation screed as a sub floor and not Duo Boards) Expansion joints required in any 8 mtr direction. Quantity: 1 = 4 pairs of Duo Boards. DUO BOARD is a quick, simple and dry solution to install with a very low thermal resistance allowing heat to transfer quickly and easily for a rapid response and maximum comfort. Made from HDF high-density fibreboard, which is engineered wood fibres that have been highly compressed. It is similar to MDF medium-density fibreboard but is denser and much stronger. The base board is laid first with adhesive side facing up then the top board is then laid brick bond fashion onto the exposed adhesive surface producing a seamless surface, preventing ‘joint lines’ from showing through carpet, vinyl and linoleum floor finishes. When laying DUO BOARD allow an expansion joint every linear 8mtrs, the expansion joint should be between 5mm to 10mm and can be filled level with the board surface using a flexible sealant/filler. DUO BOARD is not suitable for use in bathrooms, wet rooms, en-suites or any other wet areas, the boards will expand upon contact with moisture. DUO BOARD is not a structural sub-floor for use as replacement of floor boards/decks.